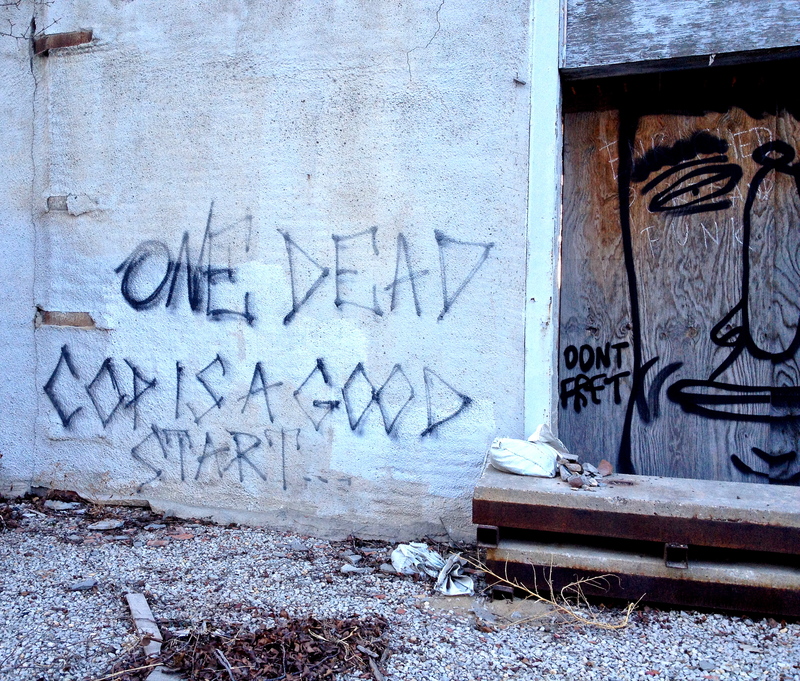 In preparing a post on graffiti in the West Bottoms I happened upon a wall with crudely written graffiti: “One dead cop is a good start”. 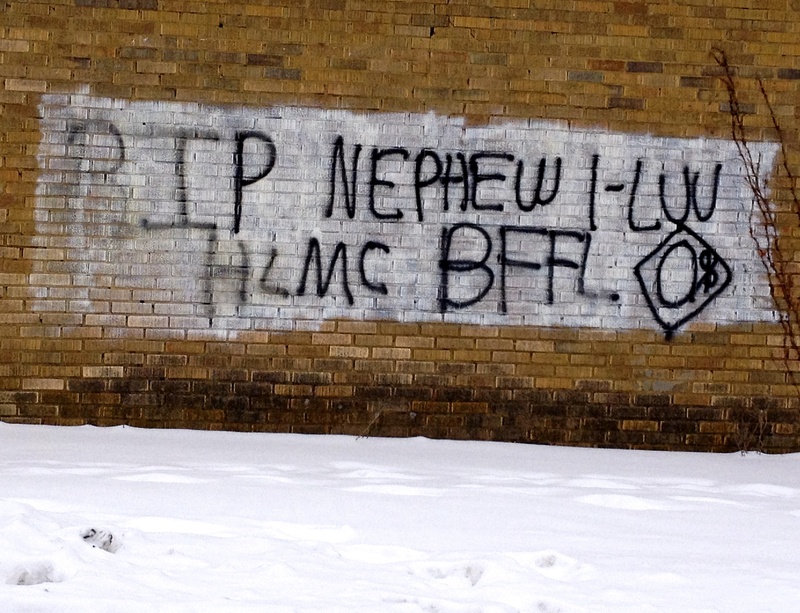 Immediately my focus shifted from the West Bottoms to graffiti focused on gangs and violence. It isn’t hard to find. Kansas City has well over 3000 gang members, far in excess of the number of local police. A small number of Kansas City gangs are extensions of gangs that originated in other parts of the country. Most are loosely organized neighborhood groups. Some are well-organized and highly disciplined. Others consistent of friends who seek community and protection within their own neighborhoods. Kansas City has gangs of both kinds. Both can be dangerous to the gang members and the communities in which they live. 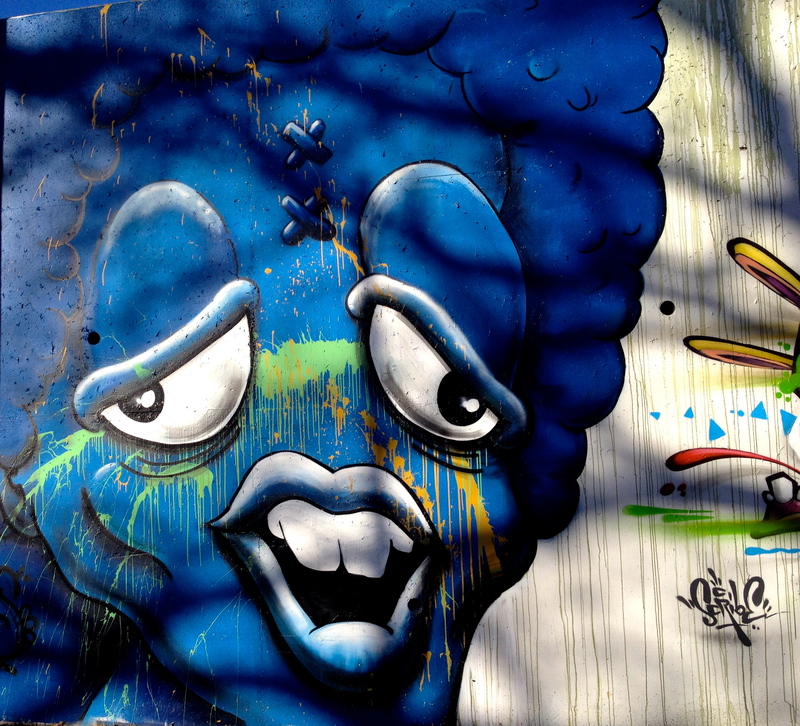 Graffiti is the language and culture of the streets. Often the language is clear and threatening. More often, it is only understood by the gang members themselves and, perhaps, rival gangs to whom they are sending a message–whatever message that may be. 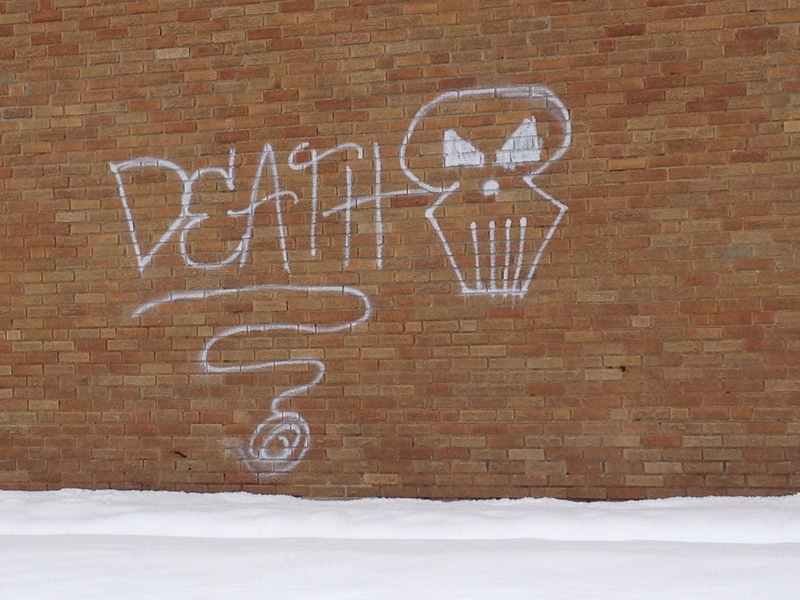 Along Troost near Brush Creek, three walls were smeared with the word “Death”. In a neighborhood where the violent deaths of young men are rampant, only a fool would ignore the potential threat suggested by the language. Below, the inclusion of the skull on a wall of otherwise seemingly unintelligible letters is ominous. It would be foolish to suggest that all hostile graffiti can be backed up by force, but the intimidation is there nonetheless. While each of us wants to believe that gang activity is in someone else’s neighborhood, that would be wrong. 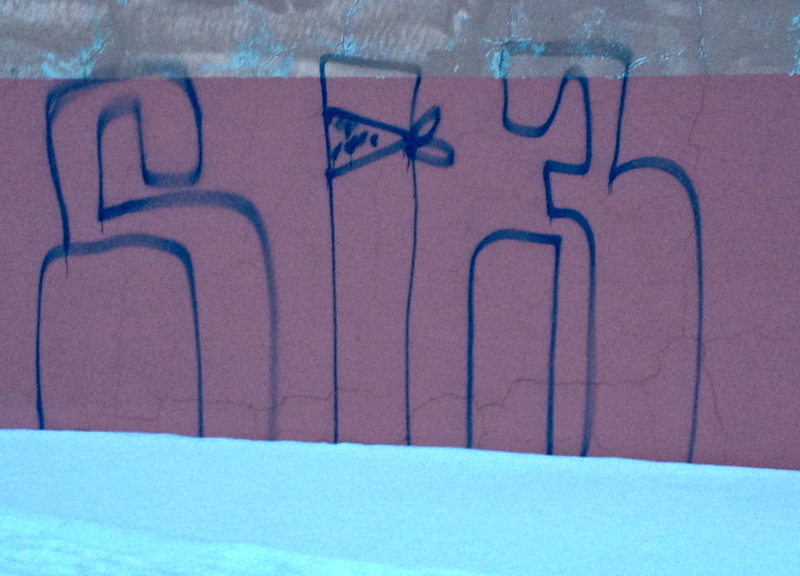 I found graffiti identifying the 18th Street Gang on Truman Road, less than a mile from the center of Independence. Surely I jest, you may say. In fact, the 18th Street Gang is known to be located in the territories of both William Chrisman and Truman High Schools. It is certainly possible that a teenager, with just a bit of gang knowledge, painted the wall, but it is more likely the gang is marking its territory. The 18th Street Gang is a multi-ethnic gang that started in Los Angeles. It operates throughout the U.S. and in Mexico, El Salvador, Honduras and Canada. Drive through the streets of the City and you will find markers for other gangs. 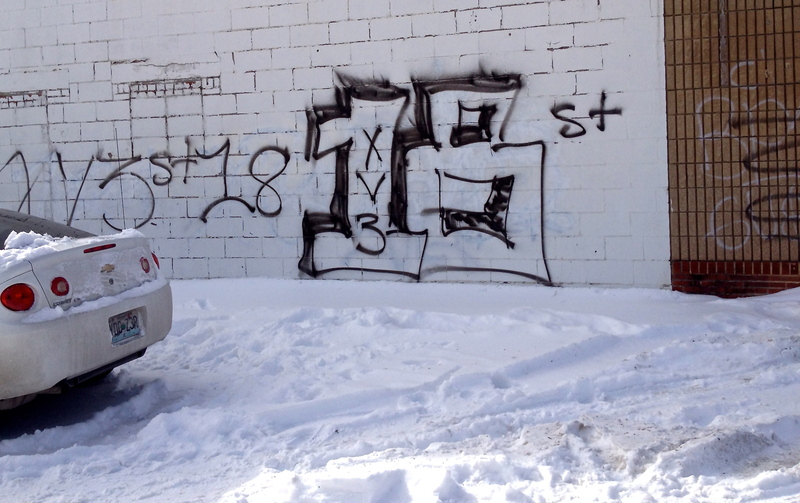 Surenos 13 (13 stands for the letter “M” indicating it is a Mexican gang) operates in North Kansas City. Like the 18th Street Gang it is a national organization with most of its membership in California. 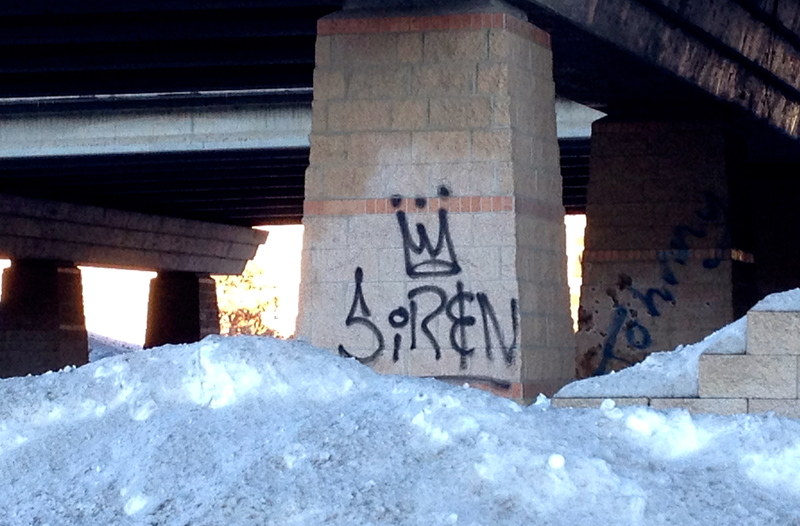 This graffiti found just off I-35 on the Northeast side of downtown indicates that the Surenos claim some territory South of the river. This next graffiti has me confused. The three-pointed crown with the dots above the points appears to me to mark territory of the Latin Kings. But crowns can be identified with gangs other than the Latin Kings. I have seen numerous similar inscriptions East of Downtown. The Latin Kings are one of the largest Hispanic street gangs in the U.S, They originated in Chicago in the 1940s. In Kansas City they operate both East and West of Downtown. Throughout our wonderful community there are telephone poles, bridges, walls of deserted buildings, walls of businesses filled with symbols similar to those above. They are designed to instill fear, claim territory and warn off potential rival gangs. You and I drive past these markers on a daily basis and don’t even notice they are present. While most of the street graffiti is confusing, the language of the street is not always capable of being understood only by the “initiated”. Some writings are easy to understand. This expression of grief is for the death of a loved one, almost surely the victim of violence in our streets. There are so many reasons people join gangs. Maybe that can be the focus of another blog on another day. But today, I want to simply reflect on the reality that not all graffiti is fun. Some of it is bad, sad and gang related. 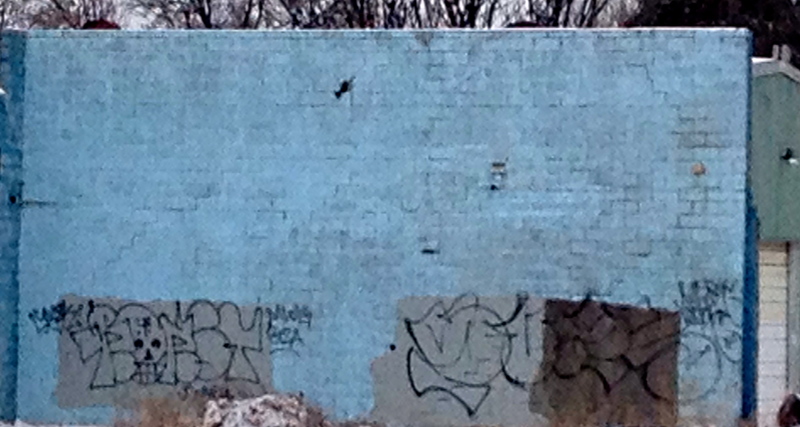 Westport has an extensive variety of graffiti, focused on Broadway, extending from Westport Road North. Our next destination is 39th and Central. Here, for the first time, I discovered a building where two walls are currently being painted with colorful murals. Hopefully, you will immediately recognize our friend, Scribe. Each painter has a unique style. Many can be found in Westport, along Broadway, Oak, and even in the West Bottoms. As I have driven throughout the city, I have become acquainted with many of the artists. Many identify themselves with names like “Scribe”, “Saron”, “Storm”, “Frost” and “feminine”. Some artists use initials “SKY ZNK” and “TCTW”. Their styles are also becoming familiar. Cartoon characters, dogs, cats, dragons and birds and even insects, are common themes. This great bull dog is identified as the work of “GEAR”. 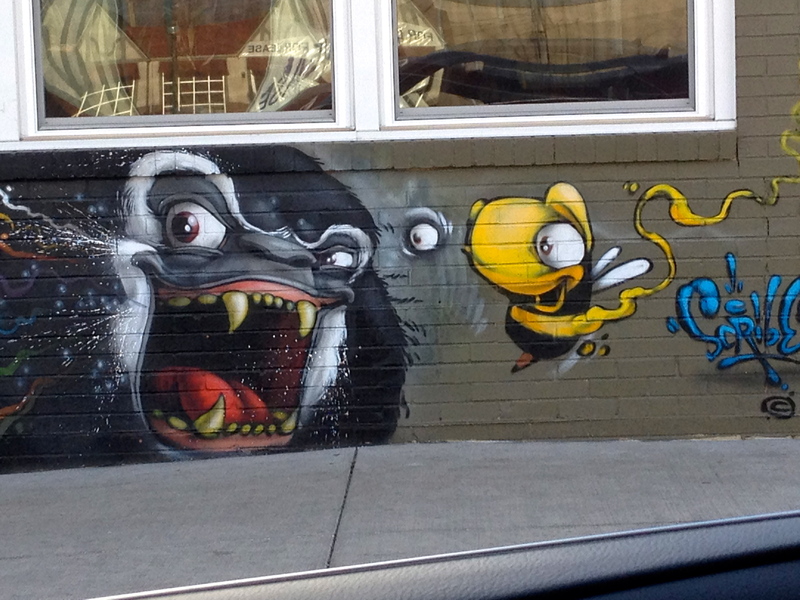 For those not yet weary of graffiti, still to be explored is art from outside the Mid-town corridors. 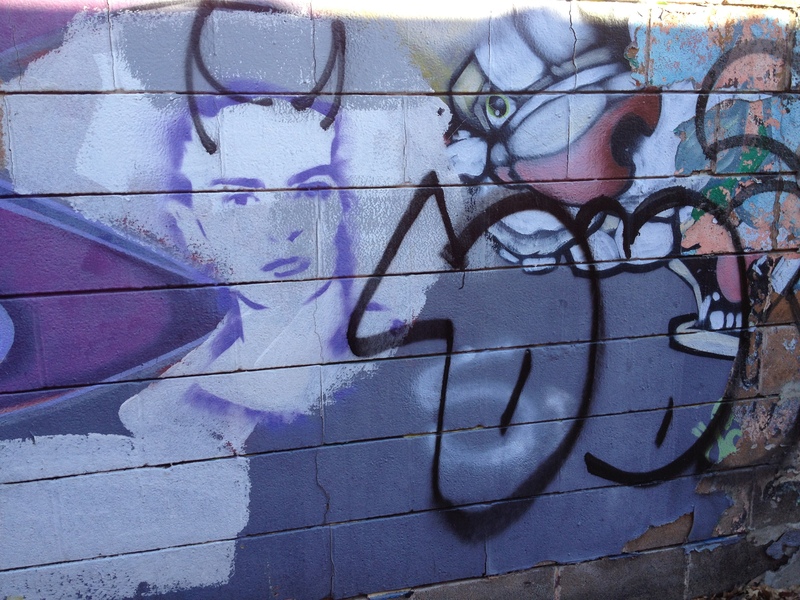 On the East side of Broadway, at 40th Street, there is a significant stretch of wonderful graffiti. Begin at the Open Fire Wood Burning Pizza shop. 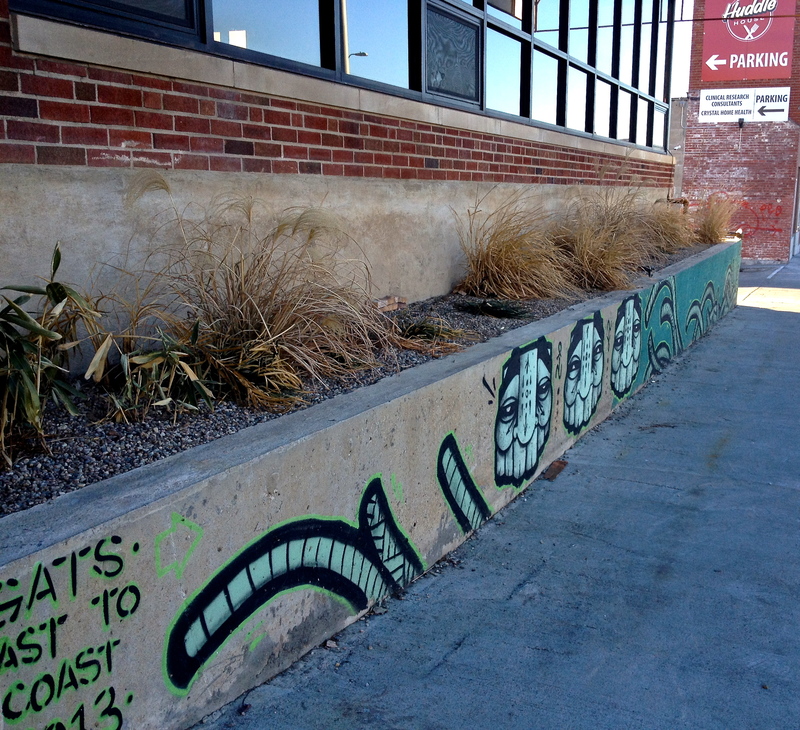 The front and South sides of the building have a wonderful mural identified as “GATS Coast to Coast 2013”. The reference to GATS sent me to the internet. 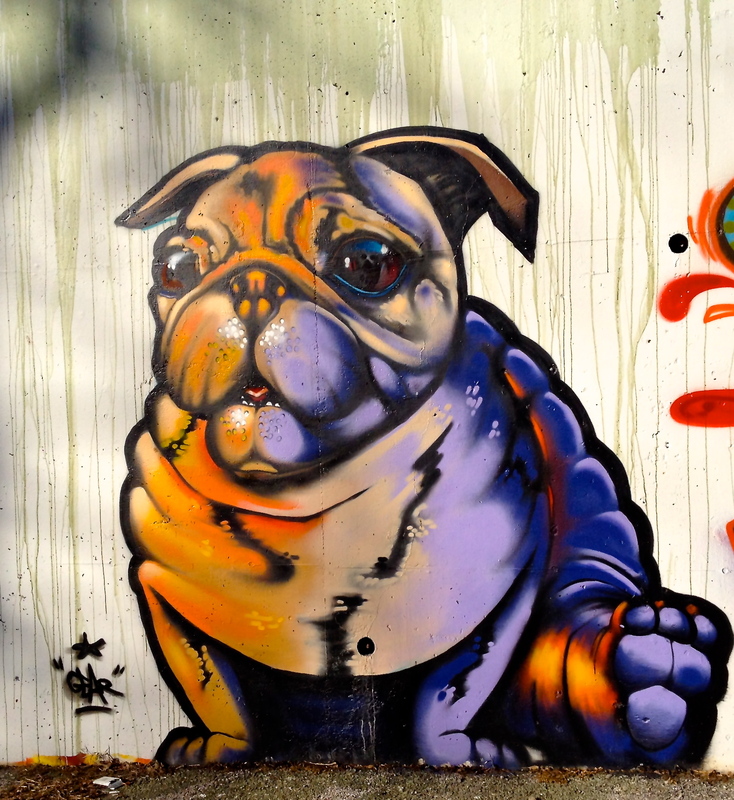 GATS (Graffiti Against the System) identifies a California street artist whose paintings are found throughout the country as well as European countries including Portugal, Germany, Italy and England. While s/he claims to paint illegally, I cannot imagine many of these murals would be in existence without the approval of the property owners. 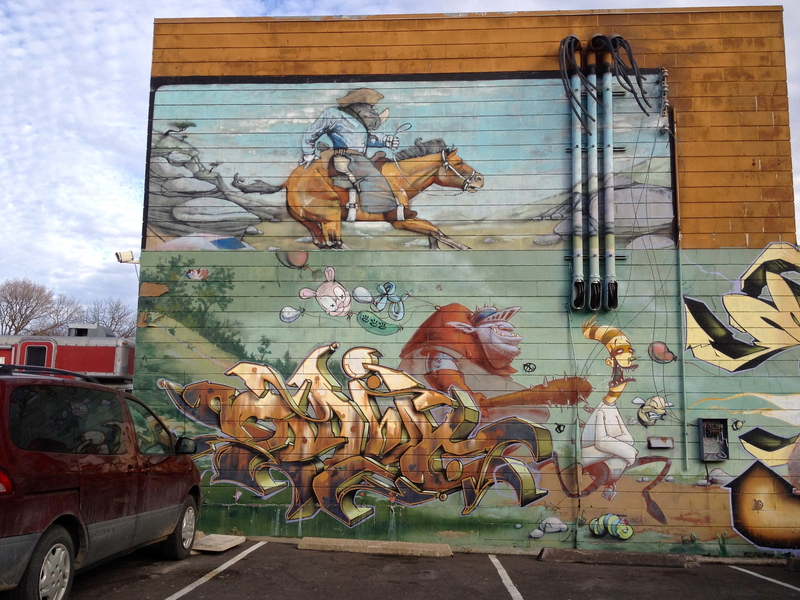 Follow the mural into the adjacent parking lot behind the Highway 420 Smoke Shop. There you will discover another series of panels created by different artists. Much to my surprise, graffiti continues beyond the South edge of the parking lot through a stretch of alley that extends East to Central. More to come: Graffiti under construction on 39th East of Broadway. Westport represents a distinctive subculture within the Kansas City community. It is hip. It is alternative. It is the place young people go on Friday night, Saturday night and St. Patrick’s Day. 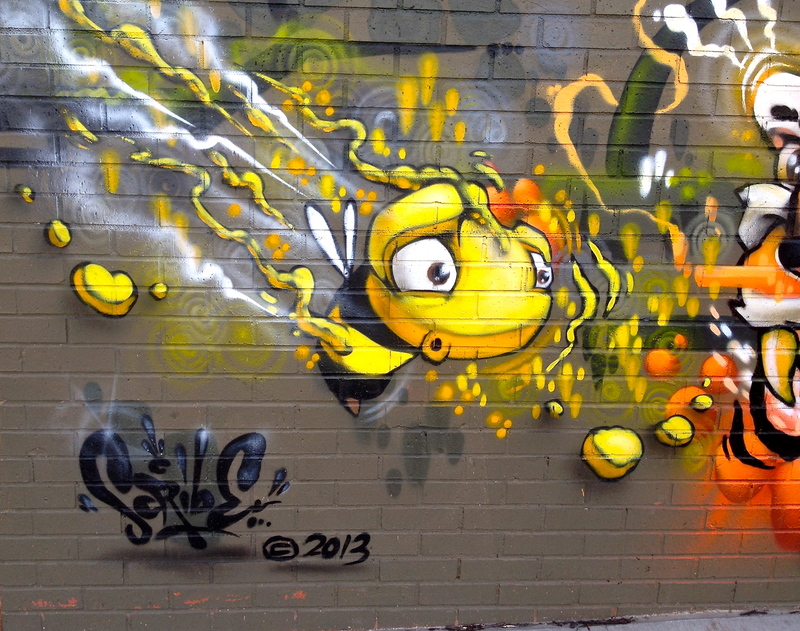 It is also a mecca for graffiti artists. 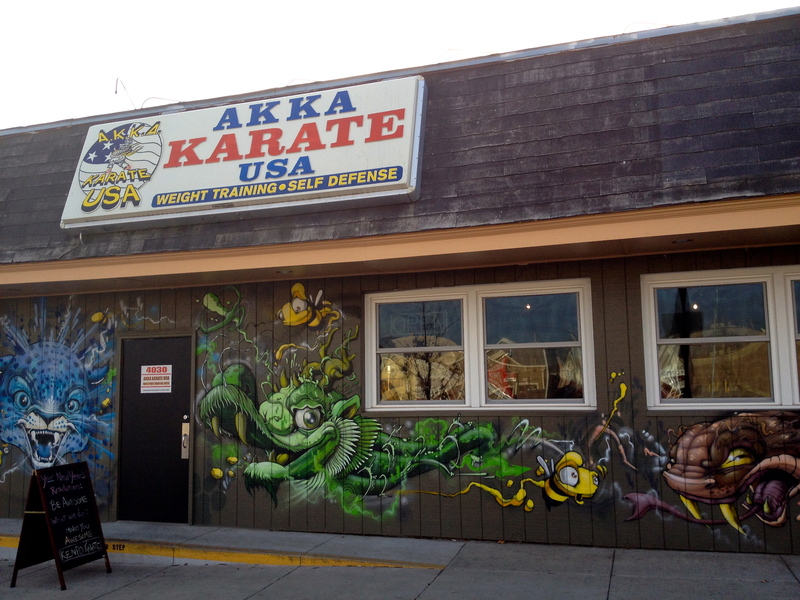 AKKA Karate deserves its own post. 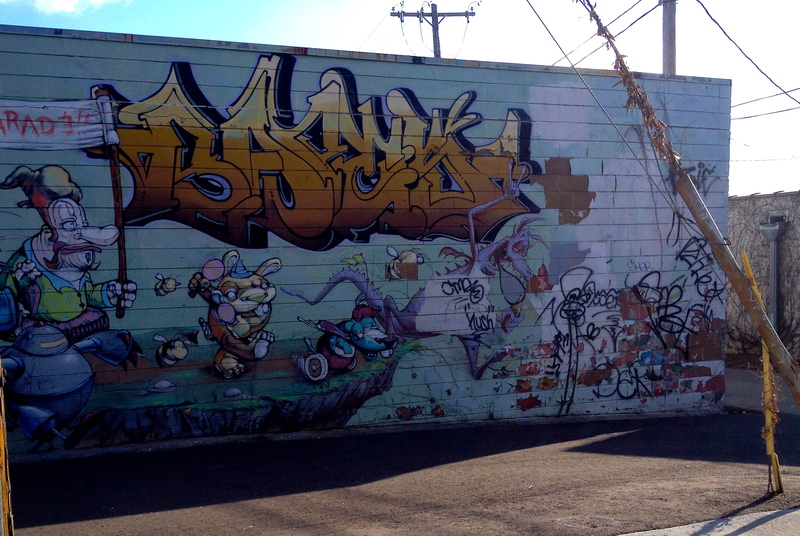 Located at 40th Terrace, just North of Westport Road, AKKA is rich with graffiti. 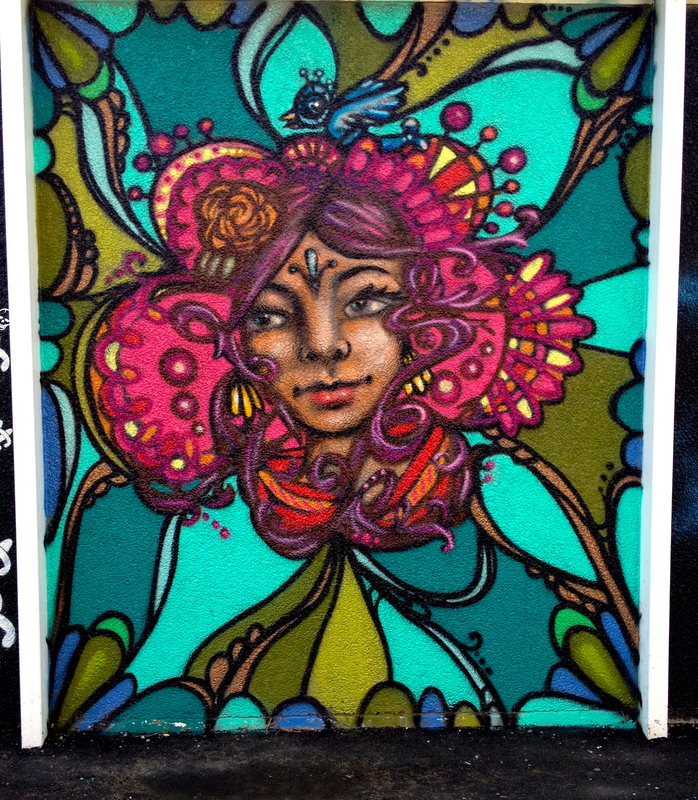 Colorful images fill the East and North sides of the building. They delight us with their creative energy. Tigers, fish with fangs, honey bees and other strange critters, known and unknowable, confront us from the walls. If you look closely, and compare the images on these walls, you will start to see similarities to other paintings on walls throughout town. Scribe, whoever you are, congratulations on some great work. Next, we will cross Broadway where more graffiti awaits us. 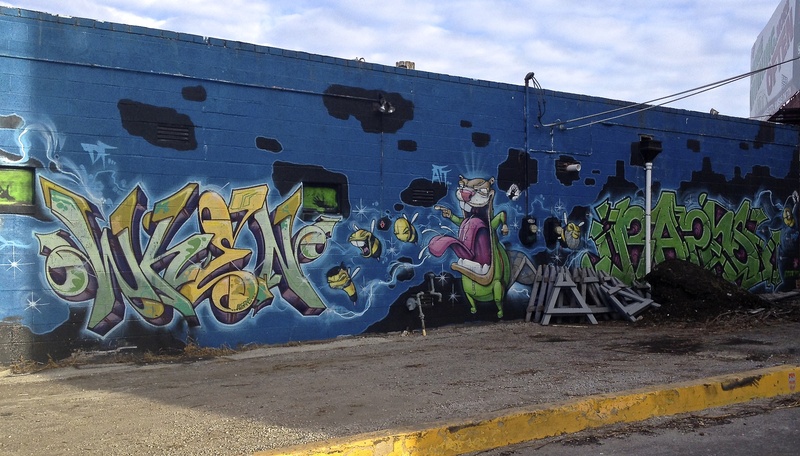 There is probably no area in Kansas City with a more varied mix of graffiti than the blocks extending from Oak to Cherry and from 19th Street to 16th. I suggest you get your walking shoes as you explore the neighborhood. Some walls are in your face. But there is graffiti everywhere. 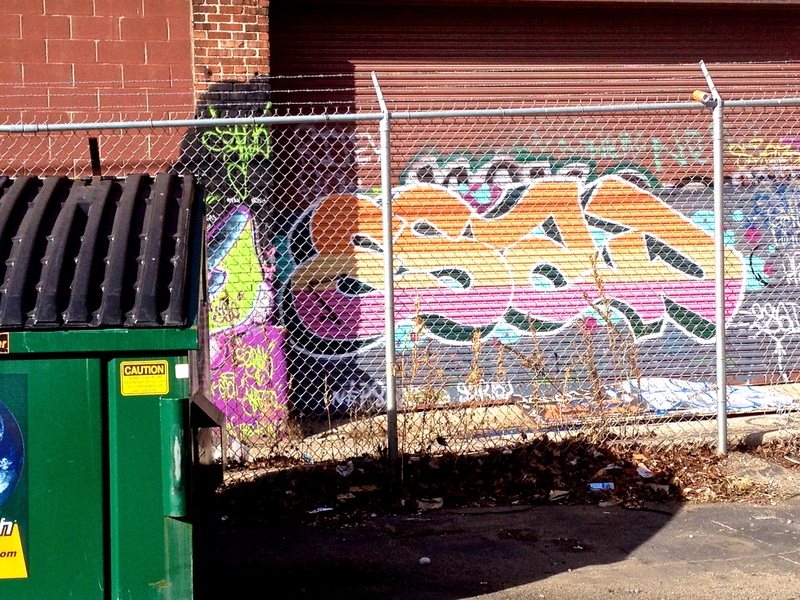 It is in alleys, behind fences and almost completely hidden by automobiles and dumpsters. Every time I explore the area I find new treasurers I have missed in prior visits. 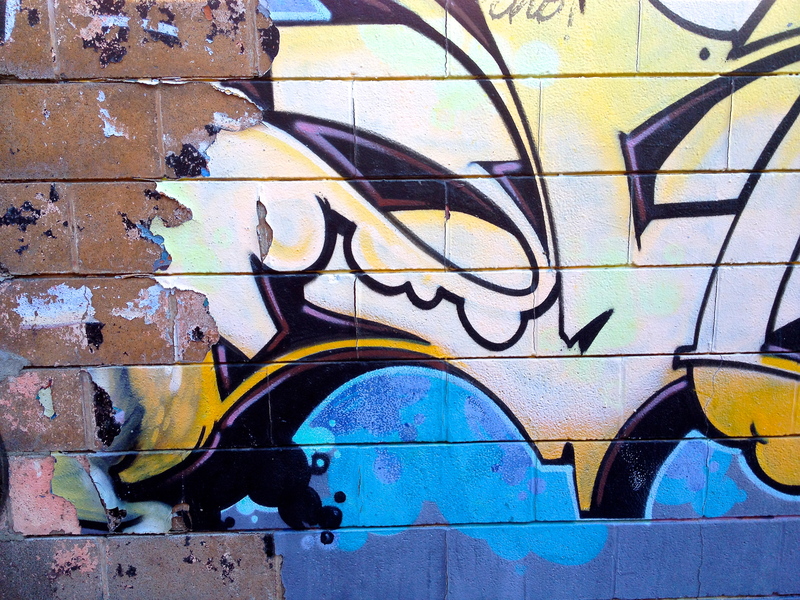 Graffiti is most often painted on deteriorated buildings, alleys and parking lots. As a result it is highly vulnerable to destruction. Last Sunday, Terry and I explored the River Market area in search of graffiti Terry and I remembered as a wonderful site of some noteworthy graffiti. Terry remembered it was in the River Market area. We found it, sort of! In an alley just East of the Broadway Bridge, we found remnants of the art, most of it behind a high fence that obstructed my view almost completely. Located between 2nd and 3rd streets, it is worth a visit, if only to record that which will soon be lost to us. I do not begrudge Kansas City development activities, but will still miss this wonderful wall. 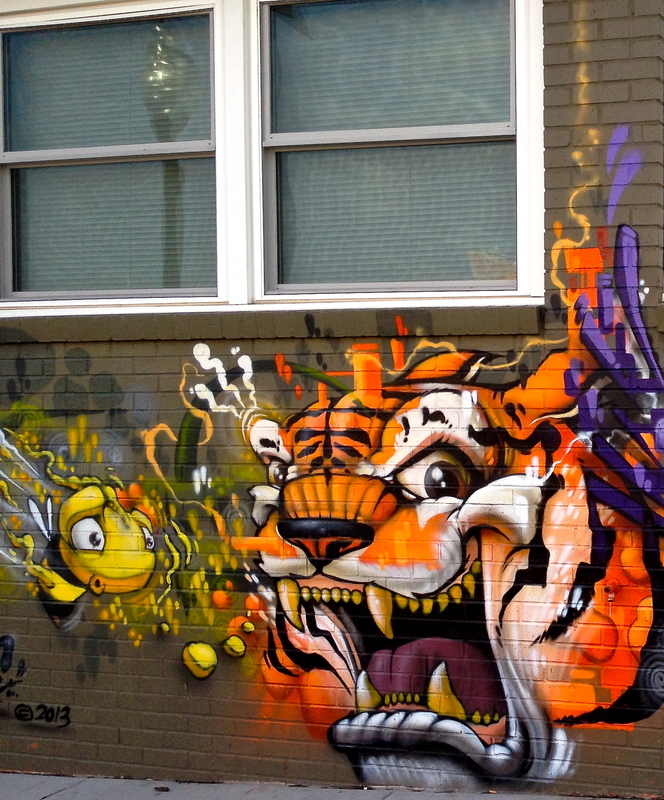 As with much of Kansas City’s graffiti, these paintings in the River Market, exist on the fringes of our community. They are, very much a part of our culture, proof that wonderful art is available to all of us. Happy hunting! 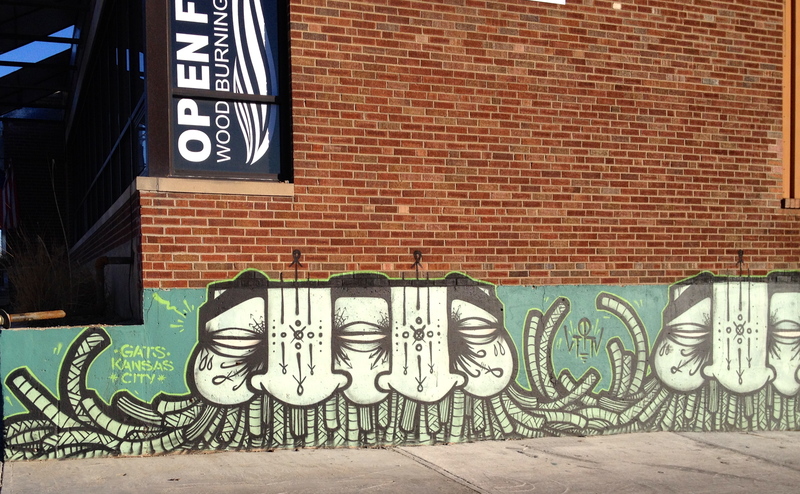 Kansas City’s most exciting graffiti is found in the nooks and crannies of our town. Many businesses either pay for their art, or at least willingly provide a canvas for their work. What a wonderful gift for Kansas City to offer the art to others. Foxx Equipment is located just North of the Broadway Bridge, where West Pennway and Washington intersect with Southwest Blvd. You can find the building by driving straight West from Broadway.vYou will know you have found this pot of graffiti gold when you see the wall with the words “Desert Feud”. I am, admittedly, somewhat confused as to the nature of the feud unless it is a battle between the demonized letters and the evil alien cartoon. At least that is my interpretation. But whatever you see in the image, it is great fun. Foxx has two parking lots, one facing the public street, the other set on the East and South of the building. Both lots are filled with colorful paintings that are great fun to behold. Whether you prefer the explorers, the ballerina in the cowboy hat or the prison escapee (in the black and white stripes), it is hard not to be grateful to the artists. Next stop is just a few blocks East of Broadway. See you soon.